May your wheels never break. – Sunshine. Whimsy. Tacos. May your wheels never break. Goodbye, Big Red, your time in my life is at an end. 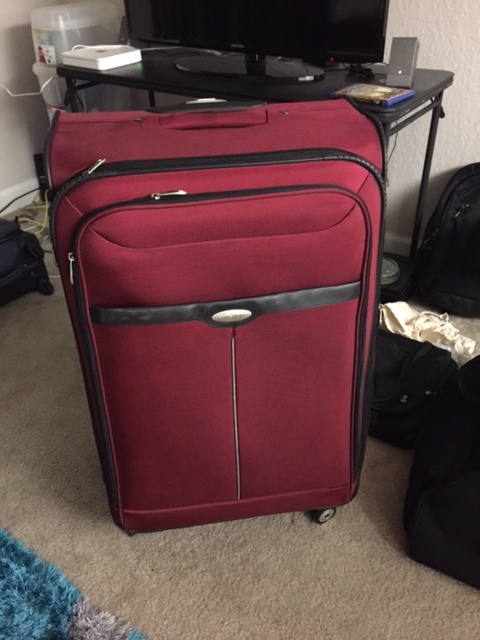 I purchased Big Red when I was about to move to Germany, and I knew that I would have to live out of a suitcase for a month or more while the rest of my stuff floated across the Atlantic Ocean. This suitcase is gargantuan- it comes up almost to my waist, and I’m a fairly tall individual. It has a strong extensible handle, and four spinning wheels that make it a dream to maneuver around airports. For most of my time in Europe, Big Red sat in the corner because it’s just too huge for most trips. For a suitcase this large, it’s just far too easy to break the fifty pound limit the airlines impose. The first year I visited Florida after moving to Germany, I used Big Red. I had rented a convertible for my birthday, and the suitcase couldn’t be loaded into the car unless the top was down. It was just that big. Since I returned to the U.S., I’ve been storing other suitcases inside Big Red, like those Russian nested dolls. The thing is, I’m never going to travel in quite the same way again. I will never need a suitcase quite this large again. That part of my life is over. I’ve found you a home, Big Red- a home with someone who is only now discovering their wanderlust, so that you will still get to travel on. Goodbye, Big Red. May you continue to be Samsonite-tough for many years to come. That is indeed a hella-big piece of luggage. I’m glad it went to a good home! SO awesome when you can hand things down/over like that. I love that big red is gonna keep on traveling! Good luck, Big Red.